A new breed of entrepreneurs is emerging in Asia. Far from chasing the latest technological fads like blockchains and ICOs, these founders have set their sights on the food supply chain – a sector that remains relatively untouched by the ever-expanding appetite of the software industry. China’s DJI has launched a crop-spraying drone for farmers. They are facing resistance, but it is often subtle. “There are not a lot of outright rejections while investors process information and make decisions,” says Praise Phuan, director of Packet Greens, an urban farming startup based in Singapore. While she got replies along the lines of “we’re interested and willing to consider,” these did not always translate into action. “It can be frustrating at times, as there was no definitive answer,” she adds. But investors are warming up to food tech. Packet Greens got its money in the end when it raised US$1.5 million from government-related venture capital firm SPRING Seeds Capital and cleantech-focused fund Trirec. The story across Asia is similar. Think “food tech”, and what typically comes to mind are food-delivery apps like Uber Eats, Foodpanda, and Deliveroo. However, technology companies and investors are increasingly aware of opportunities within the entire supply chain of Asia’s food market, which is the largest in the world. It’s no longer just about reimagining how we order cooked food but upending the entire process from farm to fork. Matthieu Vermersch knows how food is made, and he’s one investor who is seeking opportunities in Asia. The fund manager has invested in food companies and had spent four years researching into ways to improve the industry. All his efforts culminated in a new Singapore-based venture capital fund called VisVires New Protein (VVNP). It has a specific focus: It does not back technologies to improve farm yields, which it calls agriculture tech (agtech), nor does it invest in consumer products like food-delivery apps. Instead, its investment approach starts off by identifying existing global problems with the value-chain, often within the processing and manufacturing of food, before trawling the world to uncover solutions to address these problems. It sees three opportunities. The first is sustainable protein. The Guardian reports that “the global livestock industry produces more greenhouse gas emissions than all cars, planes, trains, and ships combined.” To address this, VVNP invested in Ynsect, a startup that replaces fishmeal – which is food made from fish that’s fed to farm fish – with more sustainable insect meal. Then there’s technology to produce healthy food at low cost. The Asian middle class is set to grow in number and their waistline as they adopt Western fast-food diets en masse. It’s a health crisis in the making, one that could lead to more cases of diabetes, cardiovascular disease, obesity, and cancer. Finding a way to produce healthy food cheaply is key to solving this problem. Nuritas, an Irish company which VVNP has backed, is one such company that could enable food manufacturers to do just that. Finally, the fund wants to improve the food supply chain. As more restaurants source ingredients locally, supply chains become more complicated and decentralized. Food-safety systems cannot keep up, which means new processes are needed. While mass-produced grub can be unhealthy, “it’s rare to get food poisoning from eating canned food,” Vermersch says. A food-safety issue more unique to Asia is food fraud, a practice in which food manufacturers cut corners and lace their products with harmful substances. Blockchains, which are hard to tamper with, can be used to track the production and delivery of goods, giving consumers confidence in the items they buy. Chinese ecommerce giants JD and Alibaba are already experimenting with this. Fixing the supply chain also targets another problem: food waste. With as much as half of farm production going to the trash pile, there is no use in increasing agriculture yield if the goods are not consumed. VVNP has done a first close of US$25 million for its first fund but has recently reopened their fund at the request of several strategic investors. They are currently looking to conclude their second close at US$40 million. VVNP looks at seed to series B deals and touts its connections and insights on the food industry as a selling point to potential investees. 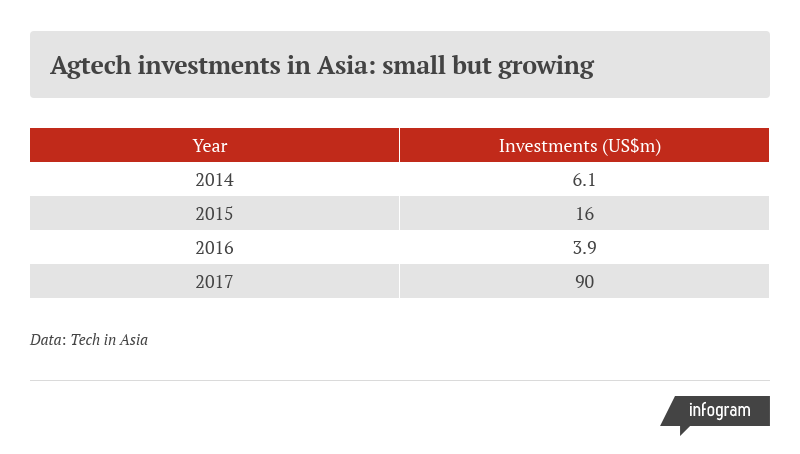 Tech in Asia spoke to Southeast Asian investors that are open to backing food-tech startups. Both Gree Ventures and East Ventures have done so. While Golden Gate Ventures has not, it says it is looking into it. But many challenges hold back investments in this field, particularly in agtech. “The industry still needs some time to go before it truly takes off, because many of these startups are dependent on either farmer adoption – which is difficult – or require significant manufacturing capability – which is also difficult in Southeast Asia,” explains Justin Hall, principal at Golden Gate Ventures. East Ventures founder Willson Cuaca thinks farmers are reluctant to face change, and startups need to do plenty of face-to-face engagement as well as educate them about agtech. 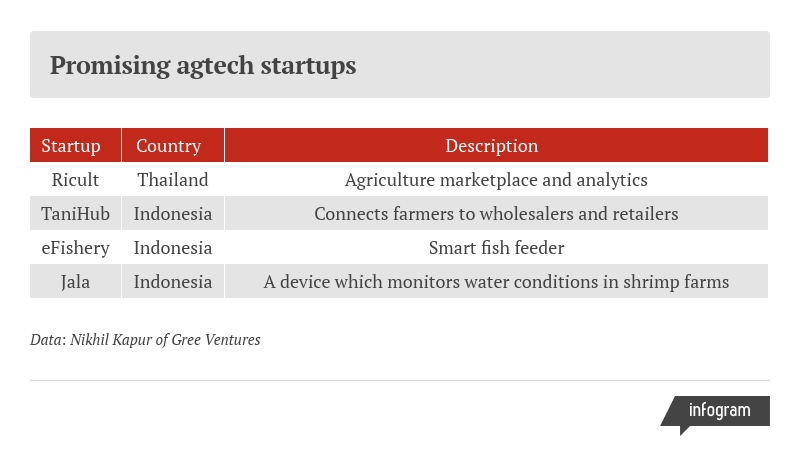 Meanwhile, Gree Ventures wants to increase its exposure to agtech, particularly in Indonesia and Thailand, where agriculture is large but inefficient. However, while a crop of quality startups exists, there are too few that are mature enough to invest in. “I’d say we are still far from investing in them, but they are active in our pipeline,” says Gree Ventures principal Nikhil Kapur, counting just over a dozen startups in his watch list. The firm has invested in one agtech firm so far: Japan’s Seak, which provides a platform for aspiring entrepreneurs to easily start their own farms. Meanwhile, in a country set to become the largest milk producer in the world, a startup plows away with an app that rents equipment like tractors to farmers. Abhilash Thirupathy started Gold Farm in 2012, and has seen agtech develop rapidly in India. Back then, ecommerce and fintech were hot areas for Indian investors. But with ecommerce maturing and fintech not taking off like people expected, capitalists are now looking for new areas to seed money. 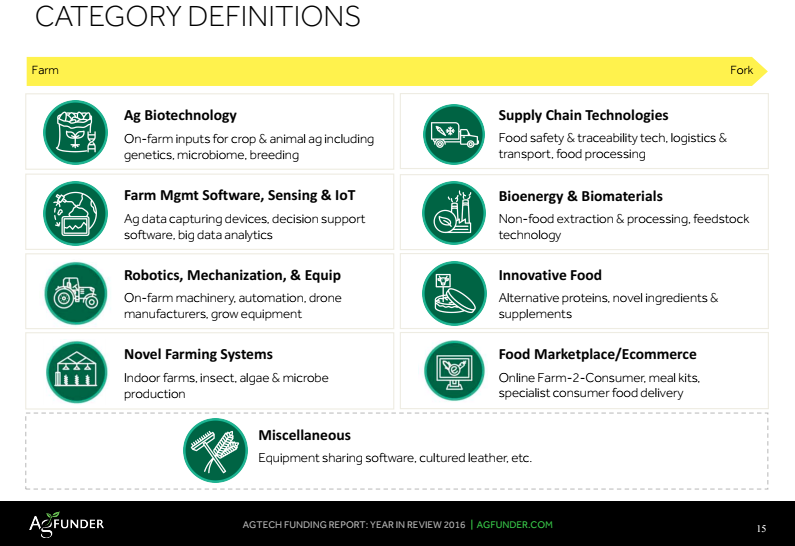 “Today, agtech is where ecommerce was 10 years ago. People are recognizing that yes, it is possible to build a sustainable, technology-based business in agriculture,” says Thirupathy. Gold Farm has benefited from this by raising more than US$2 million in funding. Thirupathy is seeing more agtech startups founded by serious entrepreneurs with reputable backgrounds, and more interest from generalist venture capital firms, not just those with a focus on food tech. “The past year has seen a sea change in the attitude of investors towards agtech,” he shares.